This post is about pickles. Not your regular brownish-green vinegary mouth-puckering pickles. It’s about bright-green, crunchy, slightly salted pickles that taste fresh, slightly garlicky and with a hint of dill – pickles of my childhood. The closest thing to these that can be found in your regular grocery store is the Claussen Pickles but they are a far cry from the real thing. Rarely you can find excellent Ba-Tampte Half Sours usually in the kosher refrigerated section. For a better version head on to the Russian Store, they are sold by weight at the counter (grab yourself a couple of pickled apples and tomatoes while you are there). 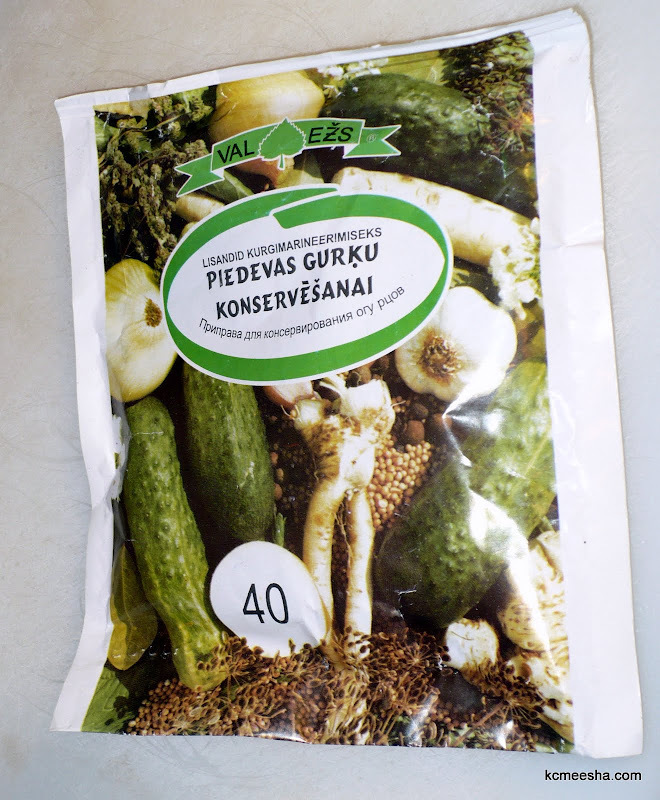 Sometimes you can find a pickling spice mix at a Russian store, or if you have friends who will smuggle it for you illegally from Eastern Europe. In the absence of pre-made spice mix I always use dill weed (fresh or dry) or dill seed, lots of garlic, some black peppercorns, maybe a hot pepper (be careful how hot), if you have cherry leaf or two, a horseradish leaf (which I’ve never seen sold here) and a few bay leaves. 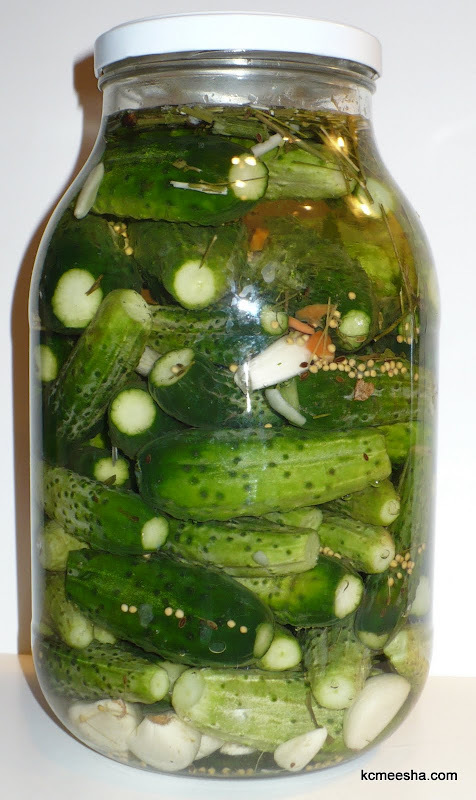 Yesterday after a downtown lunch I stopped by the City Market and bought about 5 lbs of fresh pickling cucumbers. 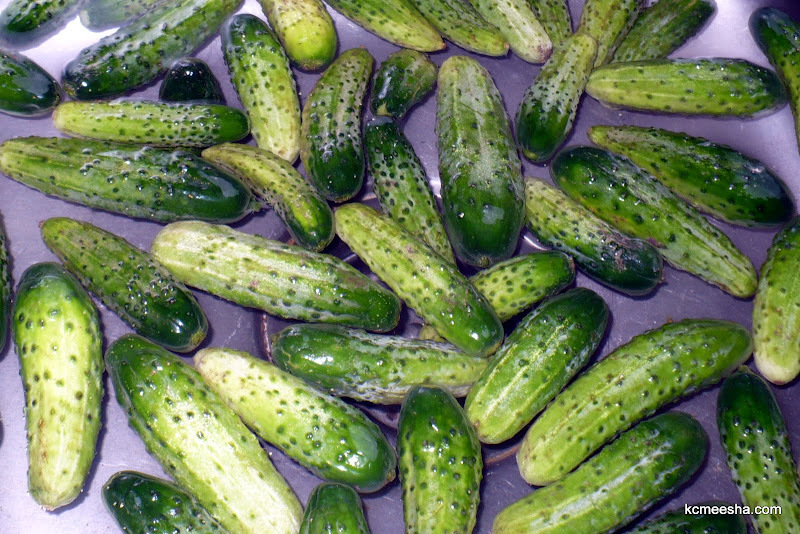 These are not gigantic-looking things sold in Wal-Mart, they are small, light-green,bumpy and crunchy. In this area they are available only during the summer. I brought them home and soaked them in the kitchen sink to let all the dirt come loose. I also cut the ends off and pierce the cucumber with a knife in the middle. 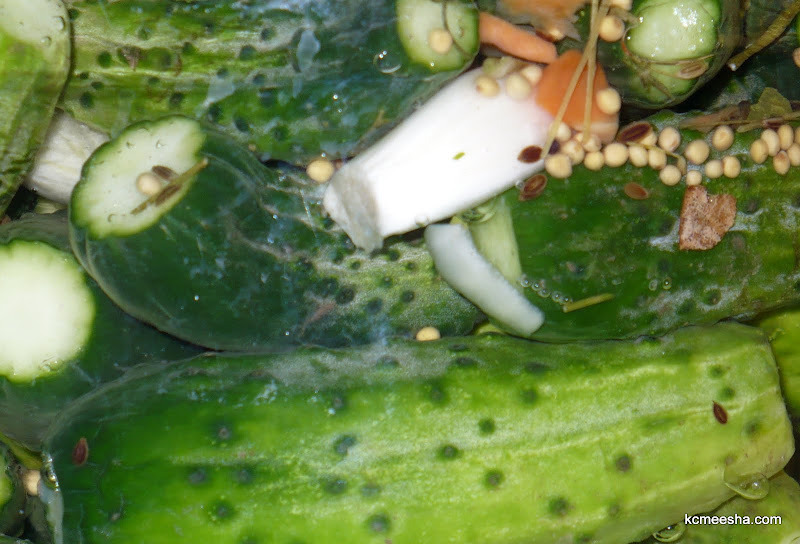 This way the brine has more surfaces to penetrate the cucumber. From there on the process is simple – wash the cucumbers and put them in the jar, adding garlic and spices at the same time. The hard part is to guess the amount of salt. The general rule of thumb is 1 tablespoon of salt dissolved in 1 liter (quart) of warm water, I think it has to be a regular tablespoon heaping with salt. Lately I’ve been using 2 measuring tablespoons of salt per quart of water.It doesn’t have to be extremely salty, maybe slightly saltier than you’d like to taste. The whole point is to keep the fresh taste and crunchiness and not to over-salt the pickles. Fill the jar to the top, cover and leave on the counter. You can start tasting the pickles the next day or two. When they reach desired taste, place them in the refrigerator. They are good with any food or drink, a hot dog, a sandwich, a shot of vodka or just by themselves. …or when you it’s just you, pickle and this song….